Would you like to bust your belly fat today? Thermodrone say they have a product that can help and it’s apparently manufactured somewhere here in the UK. Thermodrone seem to have pulled out all the stops when trying to think of a suitable name for the product because they’ve chosen to call it Extreme Fat Burner. However, the formulation of ingredients is highly reliant on stimulants and customers reviews suggest the most extreme thing about the product may be the side effects. 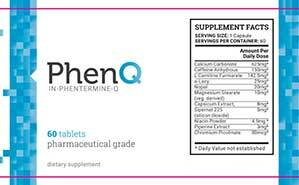 Negatives: In our opinion PhenQ will give you a better fat burning experience. What is Thermodrone Extreme Fat Burner and How Does it Work? The name says it all. This is a fat burning supplement. Products of this nature often speed up the metabolism because a faster metabolism results in increased calorie burning, and this can cause an energy shortage that necessitates the burning of fat. The problem is, although the formulation contains some good fat burning ingredients, including green tea and cayenne, the amounts have been scrimped upon, meaning any fat burning potential the product may possess comes courtesy of stimulants. When diet pills cause side effects it can be due to a number of reasons. The most common one is the use of a formulation that is too rich in stimulants. Usage Guidelines – Only two capsules are required each day—one in the morning and one in the afternoon. It’s best not to take any capsules after 3pm or the caffeine content may interfere with sleep. Caffeine Anhydrous (150mg): Research shows caffeine boosts the metabolism and encourages fat burning. It’s also a popular stimulant that’s good for providing extra energy. This should make it doubly useful for anyone who wants to take more exercise but keeps running out of steam. L-Carnitine (150mg): An amino acid that has a long history of use in bodybuilding supplements. More recently, it’s been discovered to offer value in other areas, including weight loss, but it’s also a stimulant and most people get plenty of L-Carnitine from their food. Alpha Lipoic Acid (150mg): Some animal-based studies suggest Alpha Lipoic Acid can help reduce the appetite, but the ingredient may not work in the same way for people. L-Tyrosine (100mg): An amino acid that can control the appetite, unfortunately the amount provided here is unlikely to cut it. Brown Rice Flour (50mg): Brown rice is higher in fibre than white rice and it’s capable of supporting weight loss in a number of ways. However, although it has value when eaten as a food, a tiny dose of rice flour, such as that included here, isn’t going to do a lot. Green Tea Extract (50mg): Green tea is clinically proven fat burner. It also contains antioxidants that can help improve the health, but this is not a particularly generous dose, so the fat burning power of green tea is likely to be hindered by a low inclusion rate. Citrus Aurantium Whole Fruit (45mg): An ingredient taken from a species of orange. The active ingredient is a fat burning stimulant called synephrine. It’s a very common diet pill inclusion, but mixing such a powerful stimulant with other stimulants, such as caffeine, could make the formulation to harsh for some people to handle. L-Tryptophan (25mg): A performance boosting amino acid. Some research suggests L-Tryptophan also has the ability to lessen the muscular aches and pains that are so often the natural result of hard exercise. Cayenne Powder (1.5mg): A popular spice and a key ingredient in chilli con carne, cayenne is also capable of providing a number of health benefits and is known to support weight loss by curbing hunger and helping the body to burn extra calories. Unfortunately, the amount provided here is too low to provide good results. Side effects appear to be an issue for many users. The most commonly reported problems are feelings of nausea and difficulty sleeping, but other side effects include dizziness, vomiting, feelings of anxiety, diarrhoea, and headache. Bearing this in mind, we suggest all potential users avoid taking this product without the prior approval of their GP. Thermodrone Extreme Fat Burner is exclusive to Amazon. The RRP is £39.99 per bottle (contains 60 capsules). With an RRP of just under £40, Thermodrone Extreme Fat Burner is only slightly cheaper than a bottle of PhenQ, but it does not have the same fat burning credentials. Thermodrone Extreme Fat Burner customer reviews show the formulation is capable of causing unpleasant side effects, so Thermodrone’s claim that it’s a safe and legal fat burner is only half true and the fact that something is legal does not mean it’s going to be a good buy. Despite the fact that the best fat burning ingredients are not included in sufficient amounts, the Thermodrone Extreme Fat Burner formulation may contain enough stimulants to get the job done, but people who have a high tolerance of stimulants may find the results are very poor. However, people who have not built up this tolerance, and people who do not tolerate stimulants well, may find the side effects make Thermodrone Extreme Fat Burner too unpleasant to use. This is an especially big problem for a product that’s sold without a money back guarantee. Bearing all of this in mind, the more sensible option is to invest a few pounds more and buy a bottle of PhenQ instead. There are no known side effects and reviews are good. It’s everything Thermodrone Extreme Fat Burner is claimed to be and more and, like all of the leading diet pill brands, PhenQ is backed by a 60-day money back guarantee.